Jakarta Social Dept. cooperates with furniture company from South Korea to hold training and education related to furniture field to Taruna Jaya 1 Youth Social Center (PSBR).
" Furniture factory is built to recruit students from Taruna Jaya 1 PSBR"
Taruna Jaya 1 PBSR Head, A. Dumyani mentioned, experts from Korean furniture company through Korea International Cooperation Agency (KOICA) will educate and train Taruna Jaya PBSR children within a year. 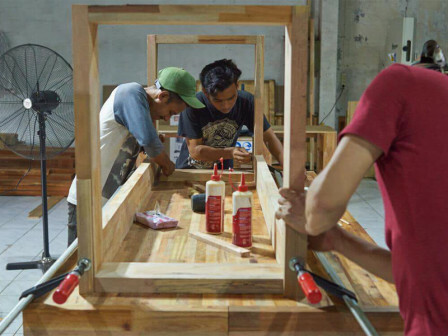 Several students who passed the training will be immediately taken to work as employee in their furniture factory which is recently opened on Tuesday (8/28) in Pondok Kopi, East Jakarta. "Furniture factory is built to recruit students from Taruna Jaya 1 PSBR. Until now, there are three alumnus from here who have been recruited to work there," he informed, Wednesday (8/29). Because of this furniture factory, he continued, children in Taruna Jaya 1 PBSR have good chance to be recruited and work by showing their skill. "We hope this could be a big chance to make our children become independent in Jakarta," he stated. KOICA Indonesia Director, Hoejin Jeong mentioned, factory is built to be a good cooperation pilot and hopefully it could create cooperation in other fields. "I hope there will be more cooperation like this in Indonesia," he conveyed.